Hello everyone! I'm still suffering from a miserable cold.. ugh. It just won't go away no matter what I do. Super annoying. Anyone else been sick lately? Tis the season. Anyway.. I decided to get some practice in for the wintery season ahead, and decided on some bare half-moons with a snowflake design. I had to freehand the moons since I'm out of stickers, so they look a little off.. circles have never been my friend. I snagged Revlon's Facets of Fuchsia and Sinful's newer version of Nail Junkie last week, too.. I'm in love with both! I need to think of something fun to do with them. Ahh these are so cute and perfect for winter! Are the snowflakes stickers? 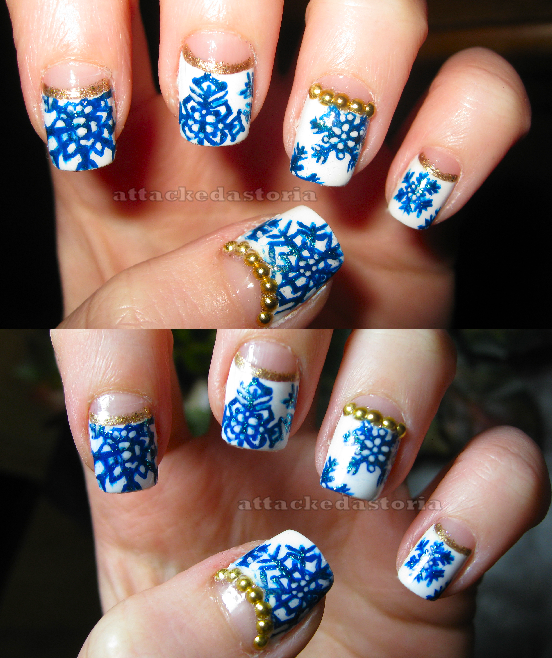 I'd love to find some cute nail stickers like these! Thank you! The snowflakes are freehand, not stickers, but I'm sure you can find some if you look. The half moons look great with an intricate design like this! Off off off with your head! Ming vase design, take two..